Chancey Lady’s induction into the Canadian Horse Racing Hall of Fame is just the latest in a string of outsize accomplishments for the diminutive pacing mare. Purchased by Niele Jiwan out of the 2006 Lexington Selected Yearling Sale, trainer Casie Coleman said at the time that both she and Jiwan had been captivated by the daughter of Camluck and the Artsplace mare Art Of Design from their first meeting. Fortunately, success on the racetrack is not measured in inches and Chancey Lady’s heart and desire would carry her to a $350,340 freshman season, capturing seven of 10 starts, including two Ontario Sires Stakes (OSS) Gold Eliminations, one Gold Final, the season-ending Super Final and her Breeders Crown elimination. 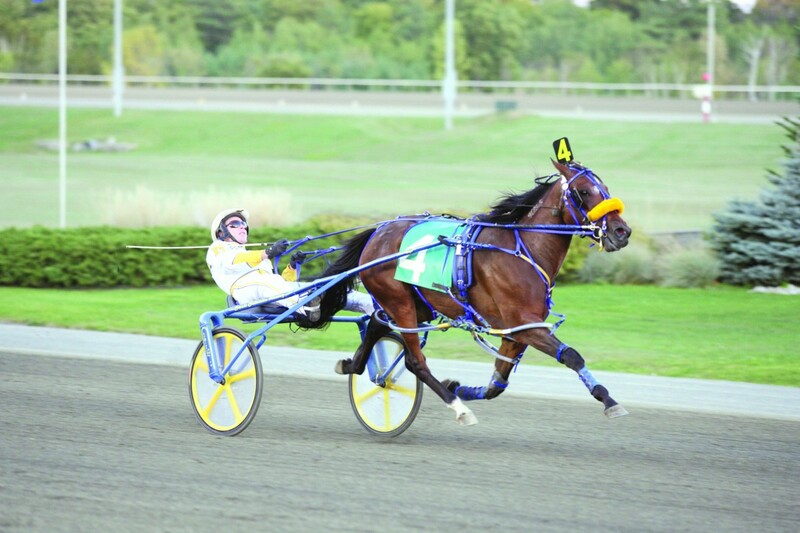 Chancey Lady’s OSS results netted breeders Brittany Farms and Daisy Acres the Standardbred Breeders of Ontario Association award in the two-year-old pacing filly division. At three, Chancey Lady picked up where she had left off, sweeping the elimination and final of the first OSS Gold Series. After a runner-up effort in her Fan Hanover elimination at Mohawk Racetrack she stormed home to a one-half length victory in a personal best 1:51.1 in the Fan Hanover final for Jiwan, Coleman and driver Mark MacDonald. However, following the race Jiwan moved Chancey Lady into the barn of trainer John Pentland. Under the guidance of Pentland and driver Mike Saftic the filly added one more Gold Elimination and two Gold Final wins to her tally. Another Breeders Crown elimination win, for trainer Richard Bilach and driver Daniel Dube, pushed her lifetime earnings over the $1 million mark and earned her the O’Brien Award as Canada’s top three-year-old pacing filly. Chancey Lady made the transition into the older pacing mare ranks under the tutelage of Mark Kesmodel, winning five of 21 starts as a four-year-old and earning $184,385. She captured two legs of the Bluechip Series at Yonkers Raceway and competed in the mares open and invitation classes at The Meadowlands and Harrah’s Chester Racetrack. Sadly, Jiwan was unable to see Chancey Lady’s best performances as an older mare. The Burnaby, BC resident passed away on December 25, 2009, eight months before she recorded her personal best 1:48.4 at Harrah’s Chester for new owner Hal Glestein of Richboro, PA. Andy Miller was in the race bike for the sparkling mile, which made Chancey Lady the fastest daughter of Hall of Fame stallion Camluck. At age five, the mare would post a record of six wins, four seconds and five thirds in 28 starts, adding another $286,200 to her lifetime earnings. At six, she had a record of 5-6-2 and earnings of $350,632, the highlight being a second-place finish in the Breeders Crown to then stablemate Anndrovette. Moving into the P. J. Fraley barn at the start of her seven-year-old season and finishing up the year under the care of Joshua Green, Chancey Lady added eight wins, three seconds, three thirds and $161,577 to her record, moving her into the elite company of horses with $2 million in lifetime earnings. In 10 starts as an eight-year-old, the mare would score two more wins and $28,965 before being retired to the breeding shed with a lifetime record of 43 wins, 22 seconds, 15 thirds and earnings of $2,083,514 in 143 starts. Since joining the broodmare ranks Chancey Lady has produced Somebeachsomewhere geldings Somebeach Baron (1:52.3f, $64,476) and Baron Chancey ($5,570), has a yearling filly by Shadow Play and a 2018 colt by Sweet Lou. She is currently part of the Winbak Farms broodmare band.